On Thursday, November 12th I had the opportunity to speak with Maria Locker, founder and CEO of Mompreneurs®, a media company and networking organization that aims to support, educate, and empower women in business. 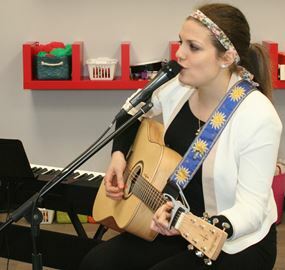 We were at Studio E School of Music and Drama in Stoney Creek, a thriving music school created by Teresa Cirillo. Cirillo started Studio E a few years ago, and it has taken off leaps and bounds. 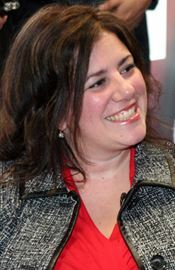 As growing pains ensued, Cirillo found that the resources and people she has found through the Mompreneur network have been a valuable component in her business, not only because of the business coaching and connections, but because of the personal perspective and confidence she has gained. The unique basis of the Mompreneur network is that it embraces the entire businesswoman, family included. 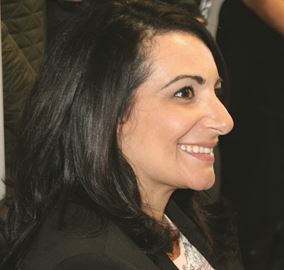 The new not-for-profit arm of Mompreneurs called Momentum Enterprise of Canada was given a generous kick start with a grant from Coca-Cola Canada to the tune of $50,000 and an additional grant of $118,000 from Status of Women Canada. The Momentum initiative will provide free online programming in the form of a flexible web-based training hub for as many as 10,000 Canadian women. This benefit is what impressed me most - the principle that building your own business should not be destructive to one’s personal life and family life, but should be in balance and cooperation with it. The Mompreneurs network is all about humanizing and decompartmentalizing the life of the woman entrepreneur. My daughter Olivia was at the event with me, and I listened in on the conversation where Maria shared how Mompreneurs can become a support network for an aspiring professional musician. GB: What kind of opportunities does Mompreneurs offer to support a music-entrepreneur? Maria Locker: We’re moms who are entrepreneurs, but we’re not all moms. A big question is how do women move into a business when they know that one day they might want to have kids? With the Momentum program, the goal is to help women have one spot where they can get the supports they need. One hub for people to go to to find those answers. The problem is that now we’re largely industry specific, so information and programs aren’t readily available in a time and place convenient for everyone. Maria Locker: We have a lot of women who work 9 to 5 and they start their business on the side. The first few years are hard, so our job is to help them get past their “five year hump.” And with a husband and possibly kids, it’s hard to get the time and resources. GB: When you mentioned the resources and the idea of having a “women-friendly” place, is that because women are possibly afraid to ask questions, or are feeling intimidated? Maria Locker: Many of our members struggle with asking for help, so we want to put as many resources online as we can. GB: So what would the entry point be for a typical person? Maria Locker: The online portal is where to begin. There are different levels of membership there, and you can find out about our different strategic partners who can provide their advice, services and products. Your membership is transferable between chapters. GB: Do you have to be a woman to be part of Mompreneurs? We have men who are speakers. We have some joint partners who are men and women working together. There are so many opportunities out there for entrepreneurs, but a Mompreneur has a set of unique needs. A Mompreneur is someone who wears many hats. For example, I arranged to have my brother take my kids to school today so I could be here at this event. I’m always thinking about my kids and my family obligations. A Mompreneur believes that you shouldn’t have to sacrifice the family obligations in order to have a business. You just need to find new ways of sharing information, getting training, and building partnerships. For example, it’s hard for me to go to an 8:30 AM breakfast meeting. But there’s nothing wrong with saying no to that. It doesn’t mean that I’m not one hundred percent committed to my business. We need a working philosophy that includes the entire person which doesn’t force women to compromise who they are, or to divide their lives into compartments.